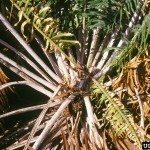 I have a sago palm that the head has died and has started to rot it has life lower. Can or should it be cut back? Hopefully your sago has pups. This will make it much easier to save. You can prune off a pup and start it as a new plant. It is more than likely suffering from an infection. It is easy to over-water these, but it is best to remember that these will enjoy being dry for a few days between waterings. You can try to kill off the existing infection with wettable sulfur, but it may be too far advanced to kill off. The plant will more than likely have a replacement pup starting if the main shoot has been damaged beyond repair.